You can remove unwanted skin discoloration with laser treatment. 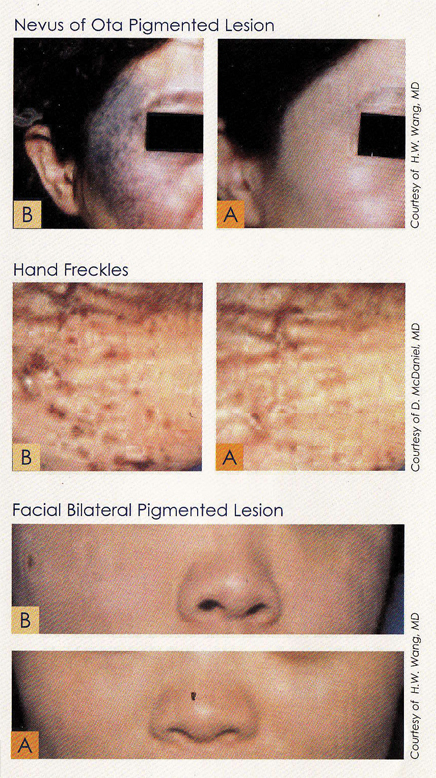 Laser treatment can remove the imperfections caused by a wide variety of benign pigmented lesions. Take this opportunity to discover the positive effects laser therapy can have on your physical appearance...as well as on your state of mind. Selective absorption of laser light pulses by melanin-containing skin cells causes the targeted cells to scatter and degenerate while significantly decreasing potential damage to surrounding tissues. The dead cells are then removed from the skin by the body's immune or limphatic system. Is any recover time needed between treatment sessions? Typically found on the face, shoulders, and other exposed parts of the body, benign pigmented lesions include everything from bluish/purplish, black or otherwise discolored spots to freckles and sun-damaged skin areas. If you have any such benign condition, chances are you're a candidate for treatment. For more information or an initial FREE assessment to discuss your needs, call our friendly and professional medical team on 01233 661662 or please visit our contact page to get in touch with us.